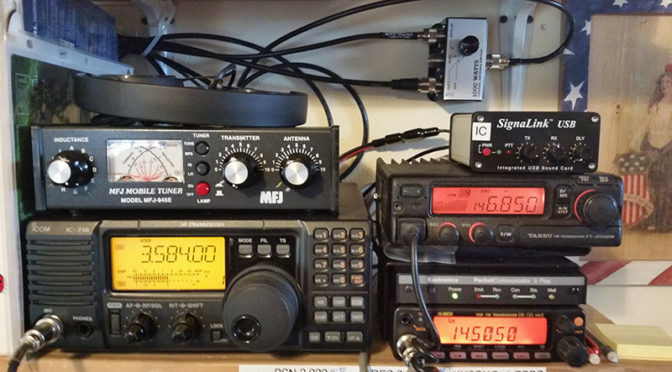 My latest station update; September 30th, 2018, I have a couple of borrowed HF radios over the last year. I am currently borrowing a Kenwood TS-450S for my regular HF operations. There has been minimal benchwork beyond making up custom cables for TNCs and a wide range of radios. Location and available space have limited what I can do antenna wise and work/volunteer commitments have kept me focused on 75-meter voice, 80-meter data, 2-meter FM voice, and 2-meter FM packet. The majority of my radio operation have been EmComm nets. I am a local Net Manager for several nets both NTS and EmComm as well as being the Emergency Coordinator/AUXCOMM Coordinator for Klamath County. Another limitation is being back in school full-time and trying to maintain an income. I am hoping to get back to QRP and other bench projects sometime soon. On the bench, the test equipment collection continues to slowly build. I’m up to an O-scope, freq counter, sig gen, several DVMs, an L/C meter, ESR meter, RF sensors, SWR meter, antenna analyzer, RF power meters, two power supplies, and now an all-band all-mode transceiver. The “junk drawer(s)” is/are also slowly building. I have a small collection of RF circuit boards from various satellite and aviation radios, and various consumer electronics devices ready to give up parts to future projects. I also have a few donors that haven’t been parted out yet in the fabrication shop. Slow going but it is an ever-evolving arrangement. Another shack upgrade is battery backup for all active radios and TNCs; currently a 2m/70cm voice, a 2m radio and packet TNC running 24/7, and an HF rig. Not only are all of the radios on battery backup, the batteries are on constant grid charge/maintenance, but a solar backup is available for grid down conditions.